The first thing you’ll notice is that the you can’t assign parent Roles to components, you must assign Subroles. When you assign the “Effects” Role, your component is assigned “Effects-1” etc. You can of course rename any Subrole and any Custom parent Roles you create. Another thing you might notice… if you select a clip with Multiple Roles in a Project, and attempt to apply Audio Enhancements, you’ll have to select the component(s) in the Audio Inspector before you can do so. Also, you cannot set the Role on a compound clip any longer, it gets its Role(s) from whatever clips are contained within it. In previous versions when you import a multichannel file, all the components would get a “Dialogue” Role. Now, each component is auto-assigned a unique Subrole: Dialogue-1,Dialogue-2, Dialogue-3 etc. Here’s why. On a mixing board, each audio channel (X-Subrole) is either summed to the main mix, or can be assigned to a Bus (X-Parent Role), and you can then control all the grouped channels with a single fader, and add effects to the mixed signal of all the channels before it is summed to the mix. There’s more you can do (aux sends, inserts etc) but there’s no X equivalent of this stuff… yet. As in previous versions, you can apply effects and volume changes to a Compound Clip created from a project. FCP X 10.3 introduces some great new options though. When you create a Compound Clip of your Project and select Show Audio Lanes in the Timeline Index, you now see all your Parent Roles (buses) to which you can also apply effects and mix the audio levels. The Compound Clip is your “summed” output. A simple example would be applying EQ and/or other effects to your Roles, and then applying a limiter to your Compound Clip. In 10.3, you can get even finer control of your material in a Compound Clip. In the Inspector, you can now choose to show the Subroles in a Compound Clip. In this way, if you have for example 4 different Dialogue Subroles (different mics, actors etc) you can treat them all separately. Show Roles/Subroles in the Inspector via the pop up menu on the top right of the Compound Clip Container. There are ways to mitigate this. One way is to do most of your mixing when you’re still in the project, make it into a CC, then do a final pass of Mix/EQ/Effects to the Roles and Compound Clip Container only. The third way is to do your final pass completely in Subroles View. 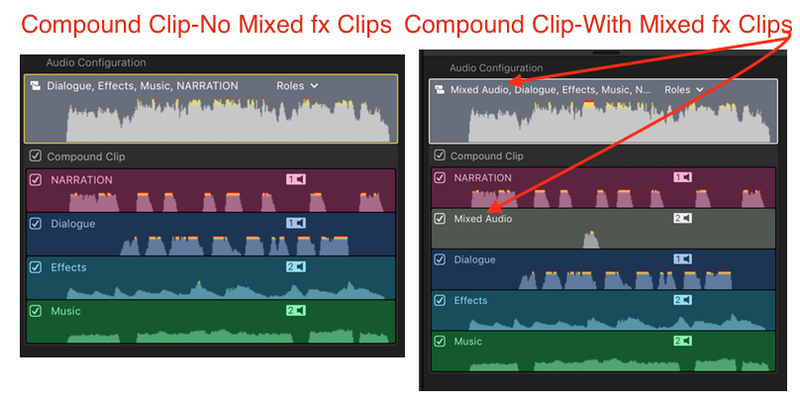 You can still add an overall effect (Limiter, Compressor, Master EQ etc) to the Compound Clip Container, but you’ll have more fine grained ability to mix/effect your subroles, and have no need to move back to Roles view. Regardless of whether you work in Roles or Subroles view, any mixing/effects you apply to the Compound Clip Container will affect the individual Roles and/or Subroles. The method you choose kind of depends on what your export will be. If you need to export a mix with individual Subroles split out, or have fine grained Subroles you want to tweak individually, you should probably mix in Subroles View mode. And if you do.. stay in it! Importantly, if you share/export from Subrole View, you then have access to all Subroles in the Multichannel Share Settings. You can still do basic D/M/E splits if needed, but this preserves the option to do more detailed splits. New “Mixed Audio” Role – What The Heck Is It? Confused yet? There’s more… Clips with multiple Subroles act differently too! Previously, if you added effects to multichannel (multi-subrole) clips – like a split mix, or production dialog with multiple mics – it would sum the output to single parent Roles. This is the same in 10.3 if a multichannel clip has only one parent Role, such as the production dialog example above. You assign Dialogue 1,2,3 etc to the subroles, apply effects to the Clip, and it will output through the parent Dialogue Role, which is what you see when you do the Compound Clip mixing thing described above. But, since each Subrole has it’s own output from a clip now, if you apply Effects to a multichannel Clip (or any multichannel Container Clip: Multicam, Synchronized Clip, Compound Clip) which contains Subroles from different Parent Roles, you’ll see another, new Parent Role when viewing output as Roles: Mixed Audio. How Does This Affect Exports? If you’re outputting a comp stereo mix, this won’t matter, as everything is summed to a comp (Stereo, Mono, 5.1). If you’re outputting a split mix though, this can bite you as Mixed Audio contains components from more than one Role. So if you had applied effects to Multi-role Clip(s) or Container Clips inside the Compound Clip, the Mixed Audio Role will contain all of these Roles. Importantly, if you are exporting as Roles or Subroles from a Project, even if it contains clips with this Mixed Audio Role, it will not appear as a choice when you export the file. You’ll only see it when you export as Roles or Subroles from a Compound Clip containing Clips, Multicam Clips or Synced clips with the Mixed Audio Role. Now, maybe you want this Mixed Audio Role. Say a Multicam clip to which you have applied an audio Effect contains Dialogue Subroles and room tone with an Effects Subrole. And you want these both to output to your Dialogue channel on export. In general though, it’s best to apply effects to individual Components of a multichannel clip to avoid screwing up a split, multitrack output. Another feature is that you can now merge Subroles after the fact, or move a subrole to a new parent. You can also rename or delete Subroles at any time. In any case, when you do any of these things, it will apply to all components in the Library that have the Subrole you are deleting, renaming, merging or moving, so use this wisely! Lastly, Roles are now Library Specific rather than shared across all Libraries. 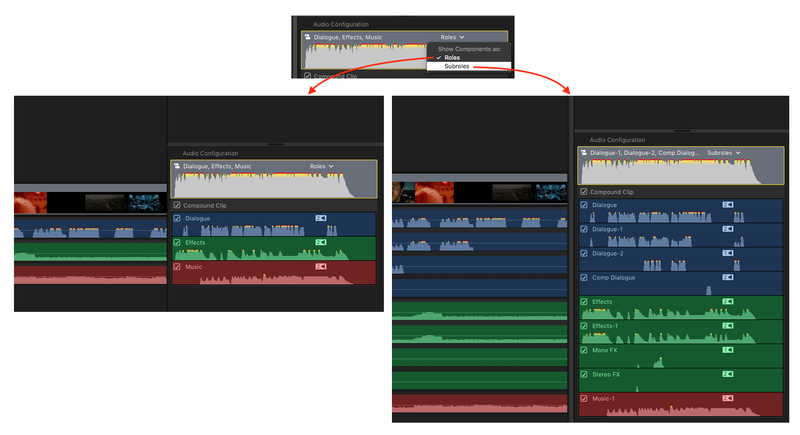 So, that’s my semi convoluted, basic explanation of how Roles work in FCP X 10.3. As noted above, definitely check out the white paper link, as there are many more details. Plus, I probably explained it badly. lol And then, experiment! Some very cool workflows and future possibilities now! Excellent post Charlie as always! Thanks!